Wool Blend Blue Pinstripe There are 5 products. Corbaraweb Professional Wear: Blue Pinstripe Receptionist Uniforms. For discerning hotels in line with the latest trends, in these pages we propose receptionist uniforms in Blue Pinstripe fabric (see also Grey Pinstripe). 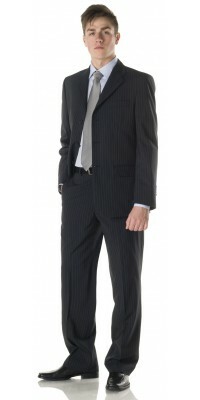 Ideal professional front office wear, suitable also for other tasks such as first housekeeper. Modern and functional, these reception garments are made on lightweight stretch wool blend (60% wool, 38% polyester and 2% elastic fiber) a very comfortable four-season fabric that ensures excellent fit and crease resistance. Furthermore, the use of fiber blends (i.e. with a part of synthetic fabric) ensures greater duration without affecting the comfort typical of natural fibers. The series includes a man’s uniform composed of a three-button Perugia Jacket and Saturno flat front trouser, and a female uniform with one-button Mantova Jacket, Roberta Pants and Ametista Skirt.